Westport’s RTM: 65 Years Young! 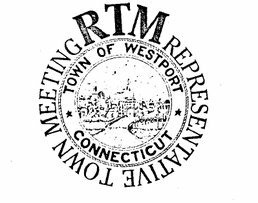 65 years ago, Westport replaced its “town meeting” form of government with a “Representative Town Meeting” (RTM). 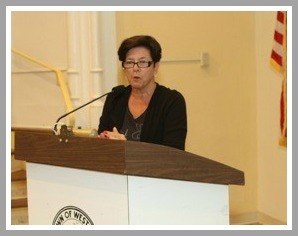 Ann Sheffer used that anniversary as the theme of her invocation at last night’s session. As Westport prepares to celebrate Independence Day — and America’s special democracy — Ann’s remarks are very instructive. When Velma Heller asked if I would give the invocation tonight, she suggested I talk a bit about the history of the RTM and its relevance today… because the 500 or so people who have served over the years embody the traditions and values of our town. I am one of a number of Westport families with multiple family members who served on the RTM. My father was on the RTM from 1953 until 1969, and served as moderator from 1959 to 1969. I was on the RTM from 1993 to 2005, as was my husband Bill Scheffler. That makes us one of 11 sets of married couples who have served on the RTM (though not necessarily at the same time). But more importantly, I realized that July 16 marks the 65th anniversary of the date in 1949 when the citizens of Westport approved the change from a town meeting to a Representative Town Meeting – which made us one of only 7 towns in Connecticut to have this form of government. We are the only fully non-partisan one. In 1999, in honor of the 50th anniversary of the RTM, we published a history of this body (it’s available here). Here are a few details that show how the RTM has evolved. In 1949, there were 124 candidates for 26 seats. But only 4 women were elected that first year. Today, both the moderator and deputy moderator are women, a first for the RTM. There were notable votes over the years. My favorite, with my father presiding, was the 1972 resolution asking President Nixon to withdraw from Vietnam. It passed, 17-15. There were also many, many evenings, often until 3 am, spent debating the education budget, sewers, and, of course, dog leash laws. In essence, the history of the RTM is the history of the Town. We were reminded of that in recent months, when we lost 2 of the most notable members: Allen Raymond (the 4th Moderator) and Bill Meyer, who gave many an impassioned speech from this lectern. I was going to add David Royce, but I remembered he was never a member of the RTM — just a wonderful gadfly who was actually arrested during one of his protests. There are traditions that I hope you will learn about and continue. For example, RTM Rules of Procedure call for the “first right-hand seat of the left-hand section as you face the Moderator” to be left empty as a memorial to Maclear Jacoby, one of the original members, and to all deceased RTM members. Ann nailed it. Happy anniversary, RTM — and happy Independence Day, Westport! This entry was posted in Local politics, Looking back, People and tagged Allen Raymond, Ann Sheffer, Bill Meyer, Gordon Joseloff, Westport RTM. Bookmark the permalink. I watched the RTM session on TV last night and Ann was delightful… From there it went into a tailspin of misinformed and unprepared RTM people. 500 thousand for 3m dark covering on our windows of every school even though the threat is from within our children’s classrooms as confirmed by our consultants we paid for ? One gentleman gave a statistic that should have deterred this yes vote to a redistribution to the use of the money to the real likely hood and the correct percentage of a problem ….the mental health of some of our high pressured and lonely children. I was very unhappy with the RTM last night …. In Westport for 40 years and a board member of LWV. Sorry to hear that Cheryl, I guess the RTM is probably not the group to help us with the proposed insanity that is going on with the Compo Beach issue, huh? They seem to be shoveling out enough insanity of their own. Thank you so much for your comments and your hot link to “history of the RTM”. My mother (Helen Lupton Jones) and my stepfather (Robert Louis Jones) were mentioned as one of the 11 husband and wife couples. I remember rousing discussions of RTM politics almost every night at dinner until the time my mother ran against my stepfather and won. That was a quiet night. Joanne Lupton, Staples class of 1962. My husband Bill Scheffler and I ran for two of four seats in District 1, so we were both elected each time…but I usually beat him by a few votes, which annoyed him (I attribute it to the fact that I had more voting age children than he did.) We enjoyed going to meetings together and usually voted the same way, but did cancel out each other’s votes a few times in twelve years. Considering the time commitment required to do a good job on the RTM, it’s great to be able to share it with a spouse!